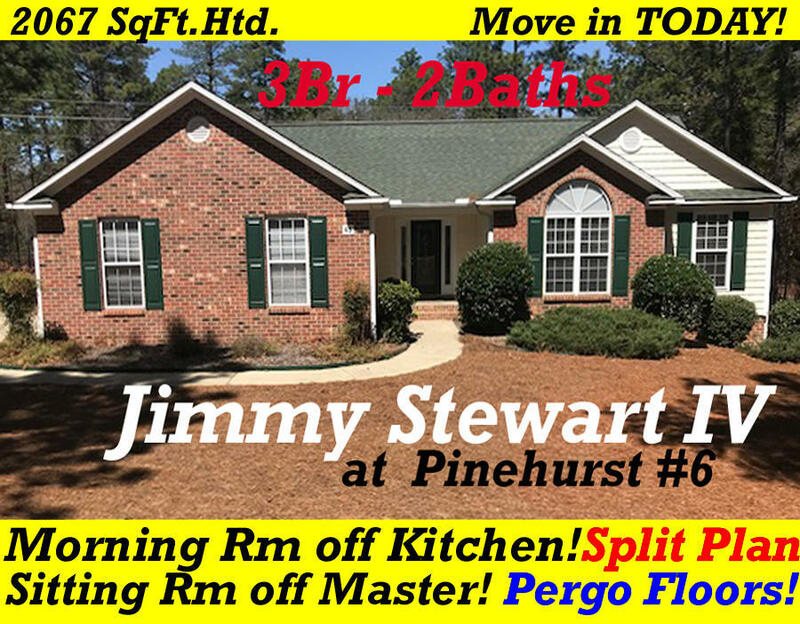 ''JIMMY STEWARD IV'' plan on quiet Pinehurst #6 Street. Split Br plan. PERGO FLOORS AND CERAMIC TILE throughout! Master suite has 9x9' Sitting Room attached. Open Kitchen with 22x14' Morning Room and Breakfast/Dining area. Direct access to patio and private rear yard. Vaulted Family Room with corner fireplace/entertainment Ctr. Pocket door to split Br & hall bath wing. Full Laundry. Oversized side entry double car garage. Pull down stairs with additional attic storage. Shows GREAT! .... NON SMOKERS & NO PETS, please. IMMEDIATE AVAILABILITY IS POSSIBLE. This can be a mult-year lease. Call for more information. Pinehurst #6 is convenient to Pinehurst, Southern Pines, shopping, schools, and recreational areas. A short commute to Ft. Bragg, Raleigh, or Chapel Hill.